At Vastrap Boran, we verify the parentage of every stud animal through DNA testing at Unistel laboratories. This is not only because we use more than one bull in each breeding herd (multi-siring), but also because we believe that it is crucial to establish the parentage of our animals with 100% certainty. The confirmation of the parentage of stud animals through DNA testing is still not compulsory in most cattle breeds, but there is a strong case that it should be. In our opinion, if the parentage of an animal is not accurate, the animal should no longer be called a stud animal and would be no different from a commercial animal. When buying a stud animal the parentage of that animal determines two out of the three criteria that one looks at to assess its breeding potential, namely genetic make-up and performance data. Even if an animal’s physical attributes are absolutely perfect, that counts for nothing in the world of stud breeding if it’s parentage cannot be verified. In Quentin’s short time as a stud breeder, he has tried to learn from as many experienced breeders as possible. He has been fortunate to have interactions with many breeders who have much more knowledge about stud breeding than him. These include some of South Africa’s most prominent breeders in their respective breeds, Philip Barnard (Angus), Bernie Staal (Brahman & Boran) and Arthur de Villiers (Bonsmara). In chatting to them about what to look for in a stud bull, the common theme has been to use a balanced approach. A buyer needs to look at the bull’s physical attributes, at the bull’s performance data and at the bull’s genetic make-up (or parents). Without parent confirmation through DNA testing a breeder/buyer cannot be 100% sure of the parentage of an animal. Errors can occur with allocating the sire of a calf in many ways. There can be errors in record keeping. A female can be accidentally allocated to an incorrect breeding group. The documentation with the pairing data can be lost or damaged. A stray bull can jump a fence while you are away and you are either unaware or your staff do not tell you for various reasons. One may even just plainly forget to write it down timeously. In short, it happens all the time even in the best-managed herds! 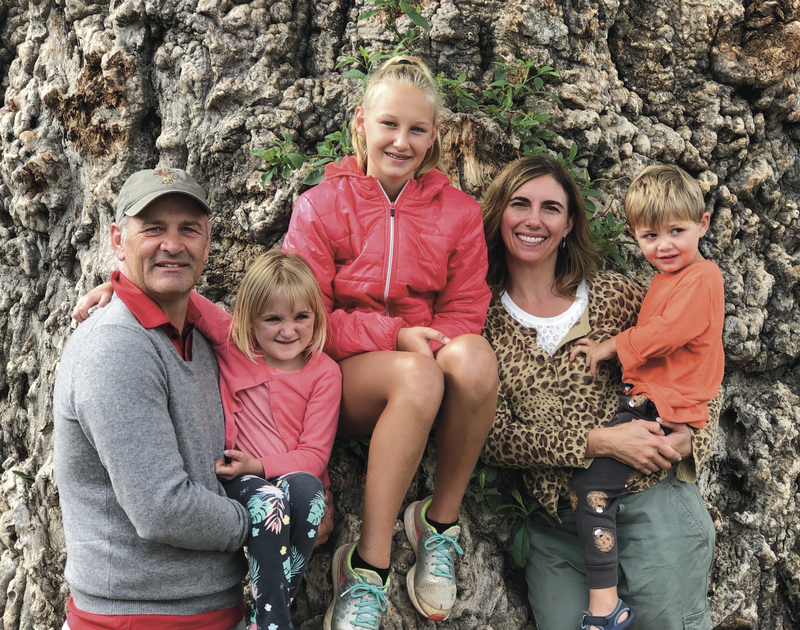 According to Dr Munro Marx from Unistel, random testing of stud animals through independent parentage verification tests have found parentage errors as high as 42% in South Africa. That is scary! Extrapolating this to the entire stud herds of any breed, it would render any performance data entirely redundant. Obviously, the high error rate of the independent testing is skewed because of repeat offenders and the fact that only animals that are not already DNA verified are randomly selected for testing. However, it is still important for buyers to be aware of the perils of buying something that is not parentage verified through DNA testing. If the parentage of an animal turns out to be wrong, then two of the three factors that one considers in buying the animal become redundant and one cannot accurately predict the breeding potential of that animal. Moreover, it is now compulsory for all bulls being used in a stud herd to have their parentage positively verified through DNA testing. A bull whose parentage cannot be positively confirmed is cancelled by the breeder’s society and its offspring cannot be registered! We have had personal experience with this in our Angus stud herd, when we recently had to deregister 16 stud heifers because we used a bull that could not be parentage verified by DNA. The bull was purchased from a respected stud breeder and it was used immediately before we realised that the DNA had not been verified. Our rush to use the bull at the start of the breeding season and our trust that all was in order on the seller’s side, ended up costing us dearly and this is not a mistake we will make again. Given the importance of accurate parentage for stud animals, one has to ask whether it is worth taking the risk of buying an animal that is not DNA verified? In order to use a bull in a stud herd, the parentage will have to be verified eventually so why not before the point of sale, leaving the risk with the seller? We would suggest that all animals sold under the auspices of the Boran Society should be DNA verified. How else can the Society give a buyer the assurance of parentage of an auction animal and corresponding accuracy of the performance data? 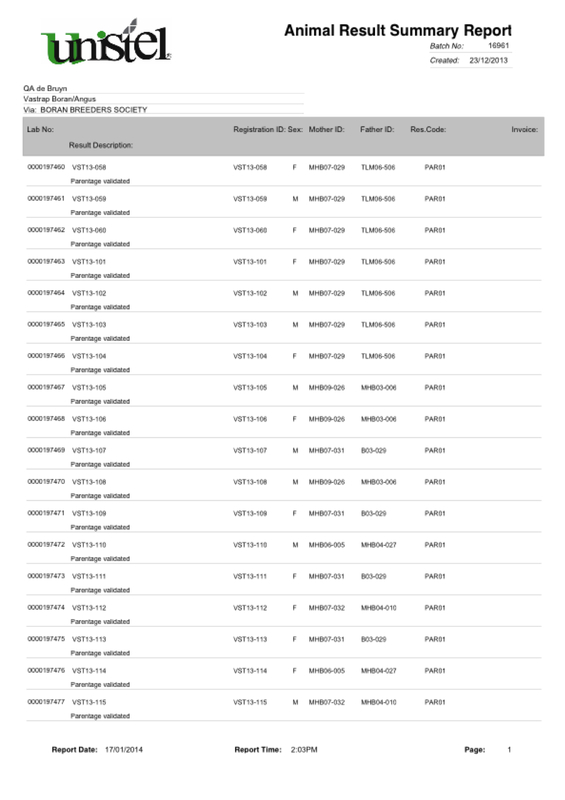 At the very least, the catalogue and opening information page on an animal on Logix should indicate clearly whether both parents have been verified through DNA. Below is an example of one of the 20 three year old Boran bulls that will be sold at the 2016 Vastrap Auction, VST 13-102. 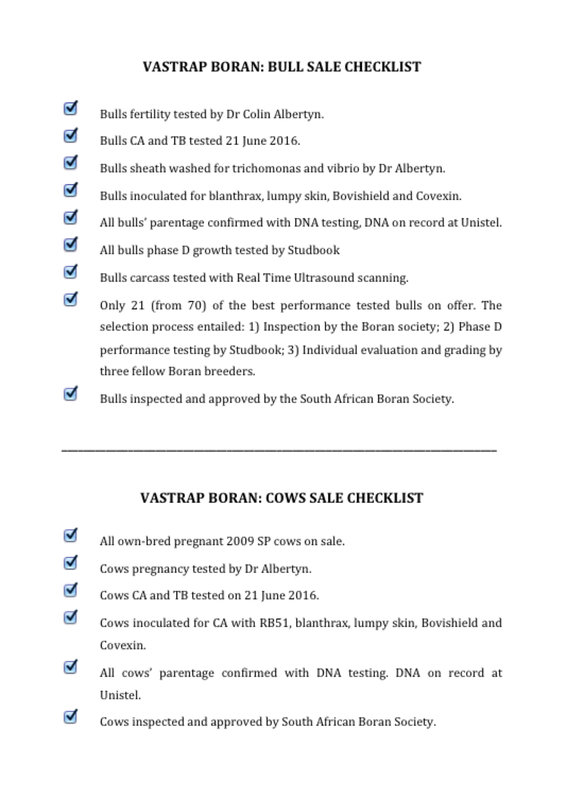 This bull’s DNA animal information page on Logix, shows that his DNA and parentage have been verified. We can assure you that this is the case with all the animals we sell as is clearly printed in our Vastrap Auction checklist. 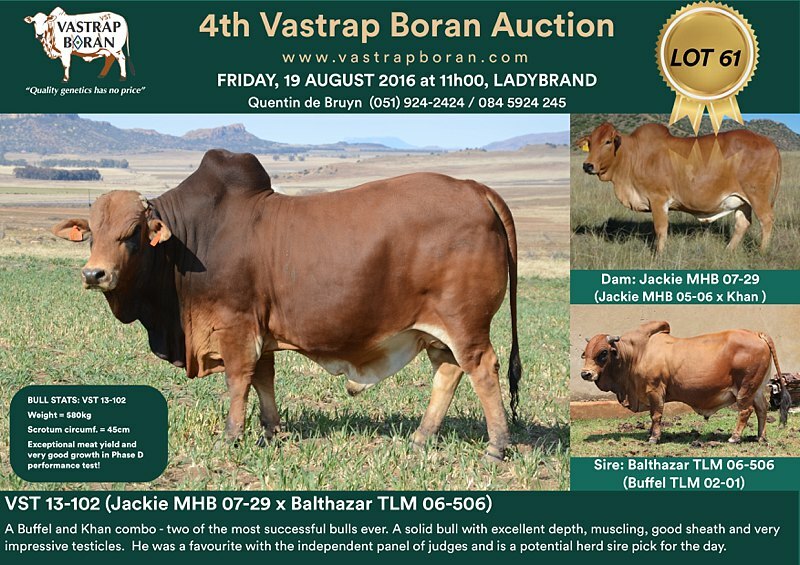 The 4th Vastrap Auction will be held on Friday, 19 August @ 11h00.